Sea urchins – wonderful to look at, painful to step on. These spiny little creatures, with shells normally measuring between 3 and 10 cm in diameter, come in colours from black to shades of green, brown, purple, blue, and red. Originally called “sea hedgehogs”, urchins inhabit all oceans of the Earth and can be found from the intertidal region to depths of 5000 m, depending on the species. Here, they live a peaceful life, feeding mostly on algae and, every once in a while, slowly moving to another place to – of course – find more algae. 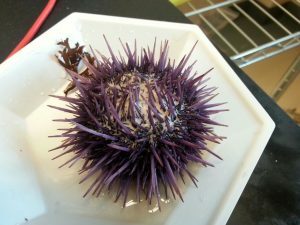 Animals such as sea otters and triggerfish hunt and feed on sea urchins, and many people do too, because their eggs are considered a delicacy in cuisines from a variety of cultures. When it comes to science, the sea urchin embryo has long been used as a model organism in developmental biology. “Sea urchins have been studied for more than 100 years and modern research started in particular at the Marine Biological Laboratory (MBL) in Woods Hole, Massachusetts, where scientists like Jacques Loeb or Frank Rattray Lillie did their pioneering work on sea urchin eggs and embryos”, explains Prof U. Benjamin Kaupp, director of the research center caesar in Bonn, who has taken up Lillie´s mantle. In fact, cell development and reproductive biology have been a central part of the MBL’s programme since the 1890s. “The sea urchin as a model organism was overtaken later by Drosophila, C. elegans, and zebrafish, which are more amenable to genetic modifications and manipulations. But even to these days, sea urchins remain the best studied and most important model for studying the motility of sperm”, Prof Kaupp emphasises. Prof Kaupp, who studied chemistry at the University of Tübingen and Berlin, visited the MBL in Woods Hole for the first time in 1981: “I started as a Postdoc for three months and then continued from 1984-1985 as a research fellow. Since 2000, some of my lab members have visited the MBL every year and, there, we do our research on sea urchin sperm. These trips have to be planned like a polar expedition”, Prof Kaupp smiles. 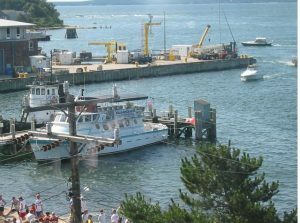 The MBL in Woods Hole is especially known for the availability of all kinds of marine organisms, particularly sea urchins, on a fresh and daily basis. “We go to Woods Hole not only because it’s beautiful there, but because the MBL has a marine resource centre where there are a lot of tanks with fresh sea water that give us access to these animals”, Prof Kaupp, who also calls the sea urchins “little beasts”, explains excitedly. Because the early development of the sea urchin has been studied in such depth, the steps of its fertilization are known in much more detail than for many other organisms. “Many, many years ago we identified ion channels in rod photoreceptors in olfactory neurons, so called cyclic nucleotide-gated (CNG) channels. We were looking for other cells in other organisms where these ion channels might play a role and I knew from my stay at the MBL in 1981 that sea urchins are the most important model for chemotaxis”, Prof Kaupp remembers. Sperm chemotaxis starts with a chemoattractant, a small molecule released by the egg, which forms a gradient around the egg enticing the sperm to navigate towards it. Binding of the chemoattractant to its receptor in the sperm membrane produces cyclic guanosine monophosphate (cGMP). This cellular messenger subsequently binds to a CNG channel, which triggers a signalling cascade that controls the flagellar beat of sperm on their journey towards the egg. Initially, Prof Kaupp’s work was focused on the signalling mechanism of chemotaxis with the molecules that furnish the signalling pathway being of main interest. After some time, the search for a bigger picture got more intense: “In recent years we wanted to understand the swimming behaviours of sperm, and, therefore, we have developed new techniques. We use photonic techniques which work with light to create a chemical gradient (caged compounds), and we can also stimulate cells with light-sensitive molecules (optogenetics and optochemistry)”, Prof Kaupp explains. But how do you get sea urchin sperm? “We tickle these little beasts with a bit of current, because when sea urchins get “excited” they release a little droplet of fluid. From the colour we can immediately see whether it’s sperm, because then it’s white, or if it’s eggs, because then it’s purple or pink”, the sea urchin researcher explains. Male and female sea urchins release an impressive number of gametes (males: 100 billion sperm, females: 50,000 eggs) directly into the marine environment, as their colourful but spiny exterior makes it rather difficult to have an amorous tête-à-tête.